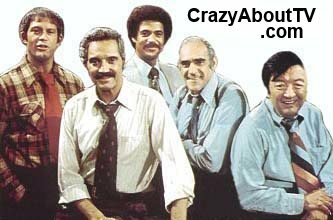 The Barney Miller TV show was a 30 minute comedy series on ABC about a distinguished Police precinct captain (Barney Miller) who presided over a group of misfit detectives. Most of the show took place in the precinct where a never-ending number of kooky criminals and citizens looking for help would interact with the detectives and Barney would have to keep the place sane! Ron Carey (Officer Carl Levitt) and Steve Landesberg (Detective Arthur Dietrich) each made a guest-starring appearance as criminals on Barney Miller before they were cast as cops and regular Cast! Only thirteen of the 170 episodes had any scenes that took place outside of the precinct! They were episodes #1, 4, 6, 12, 13, 20, 25, 74, 97, 141, 142, 159, and 160. One scary thing about Barney Miller is that with all the nut cases they got in the precinct, many real-life cops felt that the show depicted real police life better than any of the multitude of other cop shows on the air at the time! Episode #104, "Jack Soo, A Retrospective" was a tribute to Jack Soo (Detective Nick Yemana) who died of cancer earlier that year. There were unscripted segments where the other Cast spoke about their memories of Soo while the screen cut to clips of Soo's performances on Barney Miller. The episode ended with the entire cast raising their ever-present coffee cups in a salute to the friend they had lost! Hal Linden was offered the starring role on the six-season-long series, "St. Elsewhere (1982)" but he turned it down! Hal chose the last part of his stage name while driving through New Jersey. Upon passing a small town, he saw a water tower. Like most small town water towers, it had the name of the town printed on it. It was the tower for Linden, New Jersey! The chalkboard that kept track of whether officers were on or off duty on Barney Miller was eventually donated to the Smithsonian Institute with the names of the cast and crew written on it! Barney Miller won Emmys in 1979, 1980, and 1982! It was nominated for many more Emmys each year from 1976-1982! 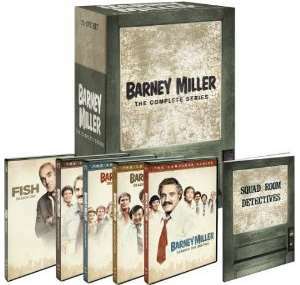 Thank you for visiting our Barney Miller TV show page!